There are various YouTube videos or music downloader (freeware or licensed) in the market, so it is necessary to choose the right freeware according to your personal preference and requirements, so that you can watch YouTube videos or enjoy music offline on multiple devices without worrying about the slow internet connection and annoying ads. Here we list some best freeware to help you download YouTube music or videos easily. Any Video Converter is a Free YouTube Downloader with Multi-functions additional. Users can download YouTube videos in multiple output formats easily and quickly, and at the same time, YouTube videos converting to popular video formats like MP4, AVI, MKV, WMV.FLV or to popular devices, YouTube videos to DVD, videos editing (clipping, cropping, flipping, merging etc ), effects adding (subtitles or audio adding, dimension, watermark, color adjusting ) are perfectly supported. Most importantly, downloading YouTube music videos to audio directly is permitted. ✔ YouTube videos converting, editing and effecting adding allowed. Additional software recommended during the installation, but you can choose Customized Installation then uncheck the box to avoid it. Any Video Converter Free is possibly the best free YouTube video downloader and converter out there. The whole process is quick and easy. Here we just list some of the best YouTube downloading freeware. Just choose the right one based on its advantages or your own requirements. Copy the URL of the music video on YouTube or other sites. Click “Download Music Files” from the drop-down menu on Add URLs button, then a dialog will pop up, click + icon and paste the YouTube URL. Just continue to paste more YouTube music links as the previous steps. You can press Online Video Tab, then simply choose Manually Select under Select Format thus you can choose the video or audio format such as MP3, AAC, MP4, 3gp, Webm etc and output quality without needing to convert. Then click OK to apply your setings. Freemake Video Downloader is also a nice YouTube videos and other streaming videos downloader. User can download the videos according to the quality, action (download, extract or convert) in one-click model. It is also very fast to grad online videos and extract audio tracks. Converting downloaded videos to popular formats like MP4, AVI, MKV, MP3 or specific devices is supported. ✔ Put restrictions on adult videos. Other additional software inserted. But this is also can be avoided if you keep an eye on it. The free version is limited to downloading at 4MB/s, but you can queue up for downloading multiple videos. Freemake converts YouTube playlists to devices by pressing only one button. It is very ery easy to use. Free YouTube Downloader is one of the popular YouTube videos downloader and converter on the web. It enables users to download YouTube videos, playlists, channel in bulk with fast speed. 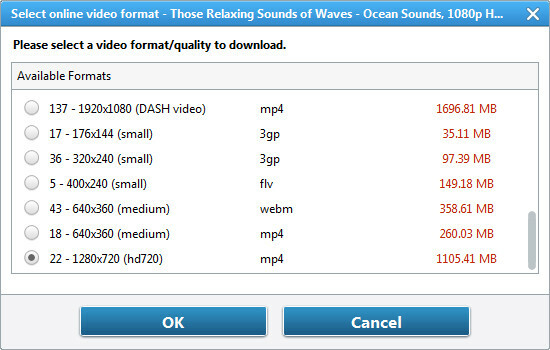 And converting the downloaded videos to other formats like AVI, MPS, WMV is supported. The user interface is so straightforward that you can use it simply. ✔ Download Videos in fast speed. Ads on the bottom line of the interface, but this has no impact on the usage. It is a very simple, tightly focused piece of software that does away with distractions to get the job done well. Great YouTube downloader works with YouTube2MP4 for Windows.